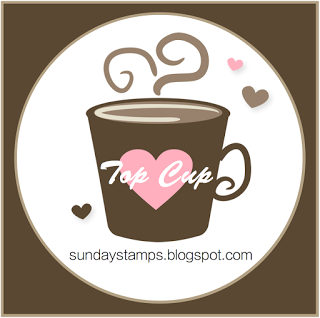 Inking on the Edge: Kraftin' Kimmie Stamps Challenge # 122...Life in the Fast Lane! 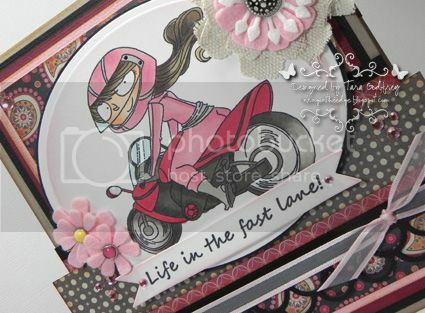 Kraftin' Kimmie Stamps Challenge # 122...Life in the Fast Lane! 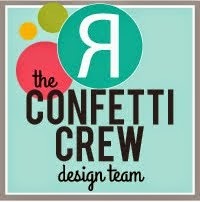 Hello Krafty friends! YAY!!! 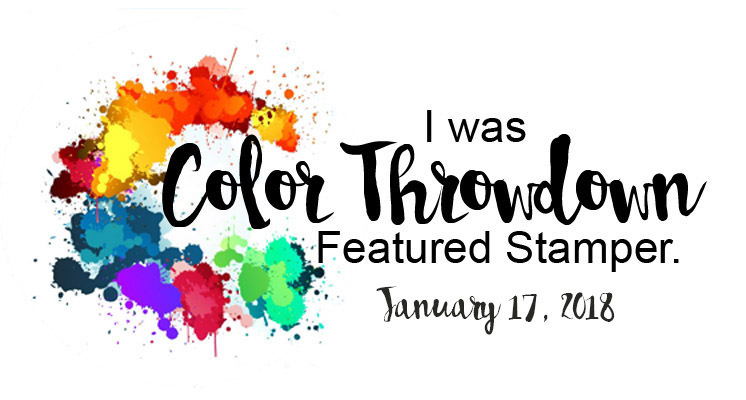 I'm joining Kraftin' Kimmie and the Krafty Girls again today for the Kraftin' Kimmie Stamps Challenge # 122. Today the challenge is hosted by the uber talented, Krafty Girl Sharon and the challenge is Heavy Metal! 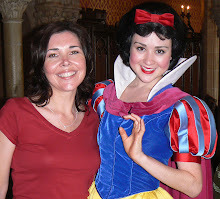 What a fun challenge...just add a little or a lot of metal to you card or creation!!! 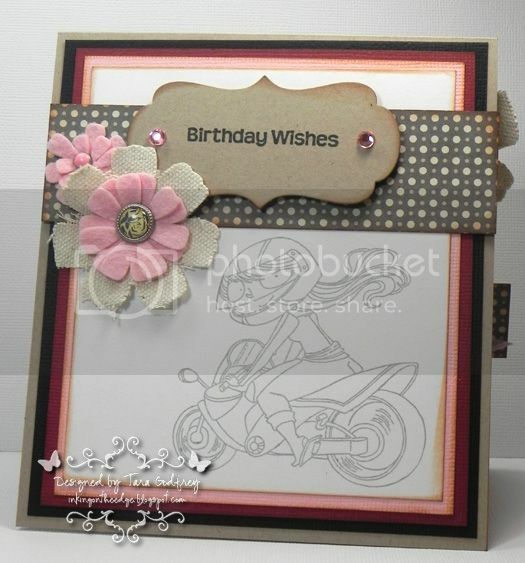 If you join us for the challenge, use a Kraftin' Kimmie Stamp on your card and link up your card to the Kraftin' Kimmie Stamps challenge blog then you will be entered into the random draw to win the Bicycle Girl stamp as featured on Sharon's gorgeous card today!!! Also, the Krafty Girls and Guests are featuring the NEW Exclusive Kraftin' Kimmie Klubhouse Stamp set called Going Places. Kimmie has created the Krafty Klubhouse for all the Krafty Keeners out there...you know who you are, smile! Just to be clear…..there is NO club to join or sign up for! ANYONE from ANYWHERE in the world can order this special set but ONLY at the Kraftin’ Kimmie Stamps Shop!! These images will not be sold individually, but only as the complete set called…..GOING PLACES! ALSO if you order this set before April 20th, you will also receive a special coupon code for 20% OFF your next online order! 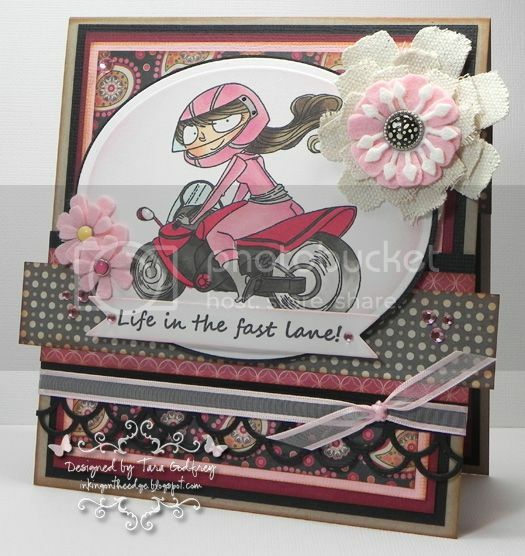 I have used this fabulously FUN, Motorcycle Girl, from the Going Places Exclusive Krafty Klubhouse Set. I coloured her up with my Copics to coordinate with this pretty MME A Happy Heart 6x6 paper pad. I cut the image out with my Oval STAX 1 Die-namics. I used Viva Decor Transparent Gloss-Pen on the side mirror of her bike. I also made some canvas and felt flowers with the Die-namics Botanical Beauty and the Die-namics Flower Trio and Leaf Set. My Motorcycle Girl Image was perfect for this week's "Heavy Metal" theme and I have also used BasicGrey Epoxy metal brads in the centers of my flowers. I added a little bling and some ribbon from my stash to finish it off. Here is the inside....I stamped the Motorcycle Girl again from the Going Places Krafty Klubhouse set in London Fog Memento ink and used one of my fave sentiments from Kimmie's Everyday Sentiment set and a few more flowers with metal brads in the centers. Well, thanks so much for stopping by and having a wee peek at my card for this week's Kraftin' Kimmie Stamps Challenge...Heavy Metal! 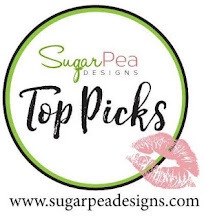 I hope you can join us and make sure to hop on over to the KKS Challenge blog and check out all the gorgeous cards my the Krafty Girls and Guests and check out the Going Places Krafty Klubhouse kit, exclusively available on the Kraftin' Kimmie Stamps Shop. simply gorgeous..this set is so much fun ..love all the images your card rocks!